MilliporeSigma recently launched three new products to help biomanufacturers navigate the evolving biopharma landscape with increased speed, greater flexibility and enhanced quality. These next-generation process intensification technologies are being unveiled at the 2018 BioProcess International Conference & Exhibition, being held in Boston, Massachusetts, September 4–7, 2018. The Eshmuno® CP-FT resin, a first-of-its kind CEX chromatography resin for the flow-through removal of aggregates from mAb therapeutics. MilliporeSigma has seen the powerful impact the new evolution of drug manufacturing has demonstrated in the marketplace. The company estimates that next-generation processing will reduce production costs by 25 percent or more and free up manufacturing capacity by as much as 65 percent. The Eshmuno® CP-FT CEX chromatography resin uses flow-through frontal chromatography to remove aggregates from mAb therapeutics, which can induce an immunogenic response in patients. 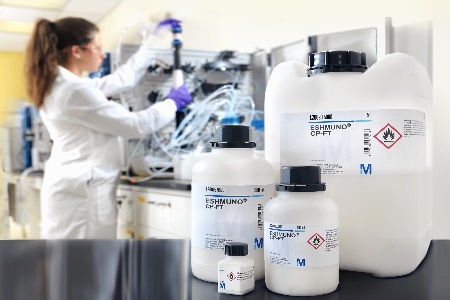 By enabling loading capacities 10 times higher than traditional bind/elute CEX chromatography, Eshmuno® CP-FT resin reduces costs and improves productivity. It requires less resin and less buffer volume while offering a shorter processing time. Phospho-L-Tyrosine Disodium Salt EMPROVE® EXPERT and L-Cysteine S-Sulfate Sodium Sesquihydrate EMPROVE® EXPERT, enable high concentrations of tyrosine and cysteine in cell culture feeds. Moreover, they can be integrated into the main bioprocessing feed, simplifying fed-batch process with optimized productivity and reduced risk. The only such products that meet industry quality and GMP (per IPEC) standards, these amino acids derivatives are stable and soluble at neutral pH and room temperature. MilliporeSigma representatives are available to discuss these innovative technologies at booth 1517 at the BioProcess International Conference & Exhibition, September 4-7, at the Hynes Convention Center in Boston, Massachusetts. The Life Science business of Merck KGaA, Darmstadt, Germany, which operates as MilliporeSigma in the U.S. and Canada, has 20,000 employees and 60 manufacturing sites worldwide, with a portfolio of more than 300,000 products enabling scientific discovery. Udit Batra is the global chief executive officer of MilliporeSigma. Merck KGaA, Darmstadt, Germany completed its $17B acquisition of Sigma-Aldrich in November 2015, creating a leader in the $125B global life science industry. Merck KGaA, Darmstadt, Germany is a leading company for innovative and top-quality high-tech products in healthcare, life science and performance materials. The company has five businesses – Biopharmaceuticals, Consumer Health, Allergopharma, Life Science and Performance Materials – and generated sales of €15.3B in 2017. Around 53,000 employees work in 66 countries to improve the quality of life for patients, to foster the success of customers and to help meet global challenges.